It is Christmas Eve in the early years of the 20th century at the Stahlbaum home in Shadyside. On the street outside, Godfather Drosselmeyer and his Nephew unload mysterious packages from their carriage. The guests begin to arrive and as Drosselmeyer introduces them to his Nephew, they are repelled by his deformed countenance. Drosselmeyer consoles his Nephew and unveils the Nutcracker, revealing its role in this night of magic. In her bedroom Marie, the Stahlbaum’s daughter, is reading Kaufmann’s book of Christmas Stories for Boys and Girls. Dr. and Mrs. Stahlbaum enter and present her with two special gifts – a beautiful scarf and a pair of toe shoes – that signify Marie’s coming of age. Marie admires her new self in the mirror and envisions her dreams. Drosselmeyer and his Nephew finish their preparations for the party. Alone, Drosselmeyer clutches the Nutcracker and remembers how his Nephew came to be cursed by the dreaded seven-headed Rat King. The party is under way, and the guests exchange gifts, trim the tree and dance. Drosselmeyer’s magic tricks delight the children, but he has even bigger mysteries in store for Marie. He gives her the Nutcracker, which she adores. Next he introduces her to his Nephew, and as Drosselmeyer had hoped, Marie sees through the Nephew’s affliction to the goodness within him. The party concludes with Drosselmeyer‘s magical piece-de-rÃ©sistance, a trick which upsets Marie so much that she runs upstairs. The guests say their goodbyes and the family retires for the night. Drosselmeyer reappears in a swirl of his cape to set the stage for the magic to come. As midnight approaches, Marie steals downstairs to find her beloved Nutcracker. But Marie is not alone; mice and human-sized rats threaten her from every side. Overcome, she faints. When she comes to, she finds herself and the whole house under a spell. Everything is growing, even Nutcracker, who becomes life-sized. The mice and rats return to terrify Marie, but Nutcracker rallies the toy soldiers and storybook characters to rescue Marie. As the battle reaches its peak, Marie’s compassion for the Nutcracker ensures victory over the King of the Rats, and the Nutcracker is transformed into a handsome Prince. He invites Marie on a journey through the glittering snowy forest to the Land of Enchantment. Guided by the Snow King and Queen, they set off on a magical sleigh ride. Drosselmeyer prepares the way for the arrival of Marie and the Prince in the Land of Enchantment where the Sugar Plum Fairy, the vision of Marie’s dreams, and her Cavalier greet the travelers. The Prince relates the tale of the battle, telling how Marie saved his life by helping to defeat the seven-headed Rat King. In gratitude, the Sugar Plum Fairy presents Marie with a beautiful gift. Marie expresses her appreciation in a dance with the Flowers. The grand festival begins, with dancers from many lands entertaining Marie and the Prince. Each dance is a gift of gratitude that Marie will carry with her forever. Her visit to the Land of Enchantment culminates with a Grand Pas de Deux danced by the Sugar Plum Fairy and her Cavalier. Christmas Day dawns on the street outside the Stahlbaum home. Drosselmeyer and his Nephew make their way to their carriage, stopping to reflect on the night’s wondrous proceedings. Marie’s compassion has broken the Rat King’s curse and the Nephew’s handsome face is restored. Marie awakens in her bedroom, wondering at the fantastic nature of the night’s events. Was it all a dream? She finds her beautiful scarf, a souvenir of her visit to the Land of Enchantment. Can it be? She rushes to the mirror and there, ever faithful, is her Nutcracker Prince. The Nutcracker is a phenomenon of artistic culture that has no equal. Not only is it a masterful blending of literature, music, dance, and visual arts, but also it has been adapted to varying cultures worldwide and is equally beloved by all of them even though the finished products may barely resemble each other. Historically its origin is from a “long short story” entitled, The Nutcracker and the Mouse King” written by E.T.A. Hoffmann in 1816. True to the character of the Germanic Hoffmann tales it has a somewhat dark side that involves mechanical or wooden dolls imbibed with human characteristics or vice versa, where humans are doomed to live their days in the form of an inanimate wooden toy. The fascination with these somewhat sinister plots carried out by evil messengers has effected their use in innumerable art forms through the years. Of course, it is also true that the stories are masterpieces of literature, and when the evil elements are slightly modified, they become delightful fairy tales beloved by children of all ages. To this end, the French adaptation by Alexandre Dumas provides the sweeter version on which most traditional productions of The Nutcracker are based. When the original ballet was created in Russia in 1892 it was a close collaboration between the composer Peter Ilyitch Tchaikovsky and librettist/choreographer Marius Petipa. Petipa, was the main craftsman of the theatrical structure and set strict parameters of timing, tempo and character for Tchaikovsky’s composition. At the time music for the ballet was often considered to be of lesser quality than symphonic music. Many composers and musicians wondered why Tchaikovsky would compromise himself to write for the ballet. Fortunately he was not of the same opinion. He considered it a wonderful challenge, and through his genius elevated the standards of musical quality for dance. His compositions for Swan Lake, The Sleeping Beauty, and The Nutcracker have become established symphonic masterpieces as well as required repertoire for reputable ballet companies. At its premiÃ¨re in St. Petersburg, response to The Nutcracker was not especially enthusiastic which disappointed Tchaikovsky; but the Tsar was pleased, and the ballet’s popular appeal enabled it to become part of the permanent repertory in Russia. Tchaikovsky was particularly proud of his use of a newly invented instrument, the celeste, for the variation of the Sugar Plum Fairy. He kept its existence a secret until the work premiered for fear that another composer might use it first. Ten years later, in 1902, the Russian Music Society gave the first performance of the symphonic suite in concert. Five of the six pieces received encore performances. 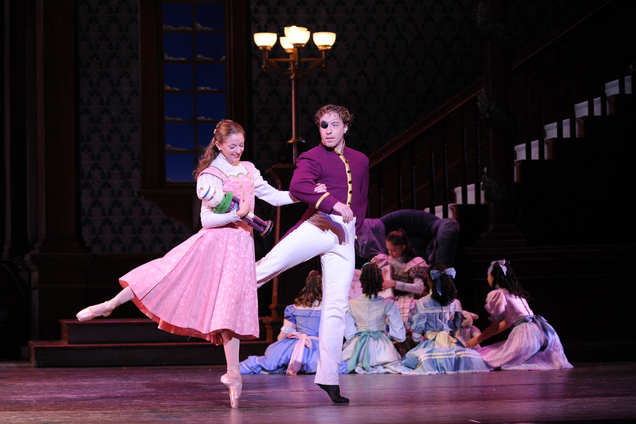 There are probably more versions of The Nutcracker than any other story ballet. Most of the choreography of traditional productions is created after the original Petipa which means that it is in keeping with his grand Russian style. However, there are Jazz, Rock, ethnic, and geographical versions. The music may be cut, enhanced and arranged. The artistic license that allows all of these variations creates a wide range of definition for The Nutcracker ballet. Pittsburgh Ballet Theatre takes pride in its productions and has adhered throughout the years to the integrity of the original artistry while embellishing the details of the production. The NEW Nutcracker is a wonderful melding of that artistic integrity with the superiority of modern technique and technology plus the warmth and familiarity of Pittsburgh that even enfolds newcomers who quickly come to call it home. As the concept of Pittsburgh Ballet Theatre’s new Nutcracker developed, artistic director Terrence S. Orr and designer Zack Brown embarked on a journey of intensive research. Mr. Orr started by attending many productions of The Nutcracker nationwide to gather information and ideas not only about what he did want, but also what he did not want. This process took several years. All of his traveling affirmed his original vision of creating a Pittsburgh-based scenario with a story that reflected more elements of the original Hoffmann tale; a little more emphasis on the supernatural and on Drosselmeyer’s intensive and calculated efforts to free his nephew of the old curse cast on him by the wicked mother of the sever-headed mouse king, dooming him to go through life as an ugly nutcracker beneath his persona of a normal young man. The romantic love of a self-less, caring and compassionate young woman who is able to see past his misfortune to appreciate his inner soul was needed to break the spell. To achieve this end, the character of Marie becomes a young girl coming of age, on the brink of womanhood. Drosselmeyer, an old friend of the Stahlbaum family, was chosen as the girl’s Godfather. He watched her grow, and observing her kind and good nature, believed that she was the special person who could break the cursed hex. He planned carefully to realize the resolution of his quest. This effort provided the thread with which Mr. Orr chose to weave the theme of the story. With the storyline in focus, the research turned to the setting and placement in time. Browsing through a flea market one day, PBT Board Member Kears Pollock happened upon an old storybook, Fairy Tales and Christmas Stories that was commissioned by Kaufmann’s at the turn of the 20th Century (observe the address of the Stahlbaum home depicted on the showdrop and the time in which our story is set). What a perfect residence source for the toys that so loyally and bravely wage battle for their beloved Nutcracker. The original Hoffmann also places great emphasis on the toy soldiers, a favorite toy of brother Fritz who sees himself as their commander. But what about the Stahlbaum’s home – what should it look like? Zack Brown delved into historical and architectural archives to find the perfect house – the F.W. McKee home that was located on Fifth Avenue in Shadyside. F.W. McKee was a lawyer and enterprising citizen, well respected by all who knew him. His father founded one of the pioneer glass-manufacturing firms in Pittsburgh. After F. W.’s family moved from the home in the early 1900’s it was thought that it passed down through his sister’s descendants before being razed to make way for apartments. Other Pittsburgh landmarks that place their stamp on this production are heralded by the clock at the pinnacle of the proscenium inspired by the famous Kaufmann’s clock where people have been “meeting” for years. Watch this clock as it keeps time for the important events of the story. Who would deny the beauty of the spectacle seen from Mt. Washington as one gazes down on Pittsburgh’s beautiful Point, a sparkling vista in sunlight or snow? And what Pittsburgher is not enchanted by the thrills of an amusement park and a beautiful carousel? After the story and setting are placed, it is left to the music, choreography, and costumes to shepherd the story into the hearts of the audience. Mr. Orr has maintained his devotion to the traditions of ballet as he created the many dances including divertissements. His challenges were many including a romantic pas de deux after the battle scene where the ballerina wears only on shoe having saved her Prince with the other one. The dance of the Sugar Plum Fairy to the strains of the bell-like celeste and her Grand Pas de Deux with Cavalier follows the traditional classic forms, especially the Grand Pas with its duet, two variations for each dancer and the energetic finale. In the Land of Enchantment the divertissements take on a very national character. For Spanish he chose to focus on the beauty and elegance of classical Spanish dance particularly in the port de bras of the dancers. The Chinese incorporates the centuries old traditional ribbon dance overseen by the Chinese dragon, the symbol of victory and royalty with a fascinating history all its own. The Russian Trepak was inspired by the Russian Partisan soldiers and their depiction by the Moysiev Ballet in the 1950’s and 60’s. The large and flowing capes along with the Cossack-like footwork conjures up imaginings of ominous soldiers of a bygone era in parade for the Tsar. With Mr. Orr’s penchant for the dramatic and his belief that theatrical elements enhance the appreciation of the choreography he added three valuable consultants to the process. To develop the libretto he enlisted the services of Milan Stitt, Professor and Head of Dramatic Writing at Carnegie Mellon University. Together they sculpted the story, drawing the desired elements from E.T.A. Hoffmann and deciding which ones to emphasize for the right dramatic focus. To implement these significant dramatic decisions Mr. Orr retained the services of Byam Stevens, friend and dramaturge, whose association with Mr. Orr began in his American Ballet theatre years. Stevens acted as dramatic coach for the dancers, while also striving to bring logical dramatic connections among the story elements. Finally or perhaps initially, Paul Gertner, local magician, arrived to create the sleight of hand and disappearing acts carefully executed at the party by Godfather Drosselmeyer. Instruction on these feats of magic occurred in the rehearsal studios with great secrecy, and those students of mystery pledged silence to their tutor. The results are a delight for the audience to behold. The crowning touch for this holiday spectacular and the vision that greets us as we enter the theater and bids us farewell as the curtain comes down are the sets and costumes with their vibrant colors that jump off the stage and into our mind’s eye. Zack Brown used the music as his inspiration. “The music is big with lots of orchestral color so the visuals must also be big with lots of color.” Janet Campbell, PBT’s Costumier describes them as “real colors, bright colors. It’s not the icing on the cake, it’s the cake. What you see is what you get.” There seems to be no subtlety here. The price tag for costumes alone approached $50,000 with most of the fabrics being chosen in New York by Zack Brown himself. There are 215 costumes for this Nutcracker production. 110 of them were built in Pittsburgh at PBT while the rest were built at shops in NYC and Washing, D.C. with some accessories being made in other places. The fabrics are sumptuous and were chosen carefully to represent the essence of the character that wears them. We speak of costumes being built not made because of the many different steps and skills required for completion such as layers and layers of tulle with pointed hems all cut by hand, and the hundreds of sequins and jewels sewn on by hand. The larger sets were created at the Michael Hagen studios in Upstate New York, using Zack’s designs. Many elements of the set had to be created in various sizes – a small Kaufmann book, a large Kaufmann book; a small castle and soldiers, a large castle and soldiers; and so on. Since its premiere in 2002, Artistic Director Terrence S. Orr has talked about the Pittsburgh elements in his production of The Nutcracker. Some of the references are obvious, but others are more subtle symbols and traditions steeped in Pittsburgh history. The showdrop is an artistic rendering of a home that previously existed on Fifth Avenue in the Shadyside section of Pittsburgh. The house belonged to F.W. McKee, a “lawyer and enterprising citizen”. His father founded one of the pioneer glass-manufacturing firms in Pittsburgh – McKee and Brothers. The large clock at the top of the proscenium, sporting the Nutcracker’s countenance, was inspired by the famous Kaufmann’s Clock on Kaufmann’s Department Store, now Macy’s, at the corner of Fifth Avenue and Smithfield Street in downtown Pittsburgh. “I’ll meet you under Kaufmann’s Clock” has been a Pittsburgh tradition for many years. Be sure to watch as the clock marks time for the story’s events! The Stahlbaum family from the E.T.A. Hoffmann tale hosts the party, but Mr. Orr has invited some special guests. Historic Pittsburgh is represented by Mr. and Mrs. Kaufmann, Mr. and Mrs. Heinz, and Mr. and Mrs. Grandview (the scenic thoroughfare on the edge of Mt. Washington.) Mr. McTavish represents the strong Scottish influences in Pittsburgh exemplified by Andrew Carnegie and his contributions to the steel industry, Carnegie Mellon University, and the Carnegie Library system. Early in the 20th century Kaufmann’s Department Store commissioned a Christmas storybook called Kaufmann’s Christmas Stories for Boys and Girls. During the planning period of this production, a PBT board member, Kears Pollock, made a remarkable discovery. While browsing at a flea market one day, he came across a copy of this storybook, which is believed to have originated circa 1904-1906. Look for this storybook in Marie’s bedroom, under the Christmas tree, and in her dream. The hilly topography of western Pennsylvania has created numerous overlooks and promontory points where one can see for miles around. One of the most heralded spots is the view from Mt. Washington. Looking down on the Point you can see the three rivers and many of the bridges that cross them. The backdrop for the snow scene is an artistic rendering of this vista from the turn of the 20th century. Several famous amusement parks in the Pittsburgh region had beautiful, artistically elaborate carousels. A couple of them still exist. Can you guess where they are?